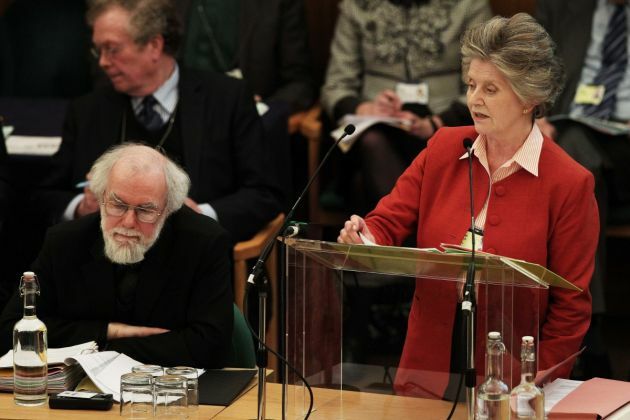 (Photo: REUTERS / Finbarr O'Reilly)Britain's then Archbishop of Canterbury Rowan Williams (L) listens while Sarah Finch introduces a private members motion on the Independent Commission on Assisted Dying during the Church of England General Synod at Church House in London February 6, 2012. The former archbishop of Canterbury George Carey has said he has changed his mind about the church's teaching on assisted dying, going against the mainstream of the Church of England. The ex-head of the Church of England wrote in Britain's Daily Mail newspaper Saturday that he has dropped his long-standing opposition to the legalization of assisted dying and he declared that it would not be "anti-Christian" to change the law. His view is contrary to that of the current Archbishop of Canterbury Justin Welby who wrote in The Times newspaper Friday on why he believes the Assisted Dying Bill, to be debated next week, is "both mistaken and dangerous." Welby wrote, "It would be very naive to think that many of the elderly people who are abused and neglected each year, as well as many severely disabled individuals, would not be put under pressure to end their lives if assisted suicide were permitted by law." He added, "Abuse, coercion and intimidation can be slow instruments in the hands of the unscrupulous, creating pressure on vulnerable people who are encouraged to 'do the decent thing.'" Carey said he is to back legislation tabled in Britain's upper chamber of Parliament, the House of Lords, that will seek to legalize assisted dying for the terminally ill in England and Wales. He noted, "Today we face a central paradox. In strictly observing the sanctity of life, the Church could now actually be promoting anguish and pain, the very opposite of a Christian message of hope." Carey said, "The fact is that I have changed my mind. The old philosophical certainties have collapsed in the face of the reality of needless suffering." Any change in the law on assisted dying has been unyieldingly opposed by Church of England bishops some of whom are chosen to sit in the House of Lords, arguing that it threatens the sanctity of life, the view also taken by the Roman Catholic Church. "I would have paraded all the usual concerns about the risks of 'slippery slopes' and 'state-sponsored euthanasia,'" said the 78-year-old Carey, who served as archbishop of Canterbury between 1991 and 2002. "But those arguments which persuaded me in the past seem to lack power and authority when confronted with the experiences of those approaching a painful death. The campaign to legalize the right to die has cross-party support and the Daily Mail said it took a significant step forward when Carey, announced his support for the proposal as a way of preventing "needless suffering." Under the bill, to be discussed, mentally-capable adults with less than six months to live would be able to request help to end their lives. Two doctors would have to independently confirm the patient was terminally ill and that an informed decision to die had been reached by the person making an informed judgement. Welby wrote in The Times, "What sort of society would we be creating if we were to allow this sword of Damocles to hang over the head of every vulnerable, terminally-ill person in the country?" The spiritual leader of the Church of England and the most senior bishop in the 88-million strong Anglican Communion also said it would be naive "to believe, as the Assisted Dying Bill suggests," that "pressure could be recognised in every instance by doctors given the task of assessing requests for assisted suicide."